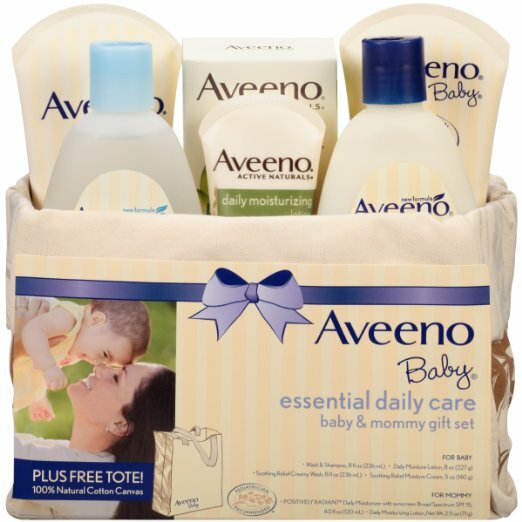 Pamper yourself and your baby with AVEENO Baby Mommy & Me Gift Set? a selection of products for newborns and moms. The collection of baby washes and shampoo? lotions? and creams contain the naturally soothing scents of lavender? vanilla? and chamomile? along with the routine of bath and massage help calm and comfort babies. This gift set also includes a bonus 100 percent natural cotton blanket and a reusable canvas box. From a pediatrician-recommended brand? this set is an ideal gift for new and expecting moms.